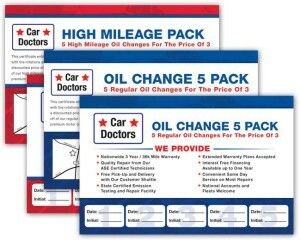 The direct mail 5 pack oil change is one of the most popular programs Mudlick Mail Founder Greg Sands uses at his repair shops across the country. Customers often come in with a direct mail coupon, get an inspection done, decline all other services & leave. A shop doesn’t make any money or loses money. The 5 pack oil change locks the customer in & makes them a future customer by pre-selling oil changes – 5 oil changes for the price of 3. You upped your ticket price, customer gets a good deal & locks them in for 5 quarters. You may lose money on the oil changes but are running a PMI each time — which is the business you want. Plus, customers can give the cards out to their family, creating more customers.